LED Mapping and Stage Design. A workshop created by OPTIKAL INK LAB which will be hosted at Red Gallery over 2 days. Attendees will design, create and operate an installation for the Extended Play event at Kamio on the Saturday night. Entry to the event is included with the workshop ticket. On day one participants will focus on theory. On day two the theory will be put to use creating an installation for the nights party. This workshop is aimed at beginners in the LED world, video artists, motion designers and people passionate about the moving image and light are welcome. Students will be given fully-functional 30-day trial versions of Modul8 and MadMapper software. 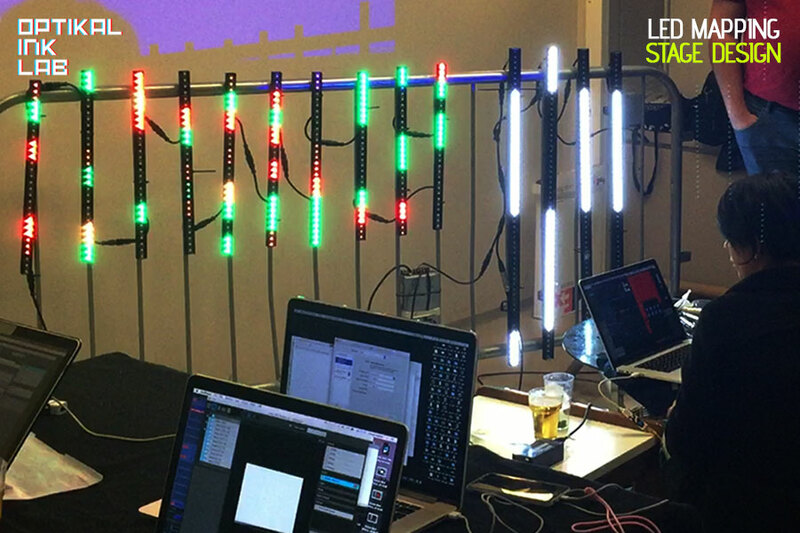 LED mapping is a technique that uses LED lighting technology and DMX/arnet protocols to design spaces, stages, installations, performances, fashion garments and more. In this workshop we expand the possibilities for those who work with lighting, stage and visual design, art and enthusiasts who want to learn the basic steps to work in this field. Laura-Optika vj, is a visual arts lover dedicated to direct, design and produce AV projects based on video projection and light, she produces herself and runs “Optika studio” her AV LABel where manage projects for artistic shows, advertising and academic contents. Since 2008 Optika has been showing her work in South America, USA and Europe in festivals like Mapping Fest, VJ university, Nuite blanche, SSA fest, Lpm and she has directed large scale projects like the “AV invader” Bogota and the VIP stage area for Katy Perry concert in Colombia, also she has worked with the International crew “United Vj’s” and has created designs for led media facades in Colombia and Brazil. Lately Laura has been creating led installations and AV performances including Fulldome.